An excellent appreciation of Dwight Eisenhower’s skills as a military commander, though by a biased observer—the general’s son, himself a distinguished officer and historian. Now in his ninth decade, John Eisenhower (Agent of Destiny: The Life and Times of General Winfield Scott, 1997, etc.) had thus far not written at length about his father. 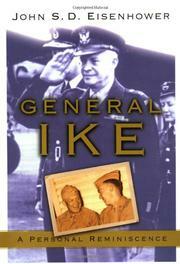 Students of military history will be glad that he did, however, for here he offers observations that other, more remote biographers have not ventured or elaborated—in particular, on the matter of Ike’s influences as a junior officer. Perhaps surprisingly, given the subsequent movie treatment, one of the strongest of those influences was George S. Patton, who, with Eisenhower, courted official disgrace after WWI by arguing for the supremacy of tank warfare in ground combat. They were right, of course, as WWII bore out; of that future war, Patton effusively predicted, “Ike would be the Robert E. Lee and Patton would be Ike’s Stonewall Jackson.” That prediction was less accurate, as readers will discover. Elsewhere, Eisenhower considers the curious role that Douglas MacArthur had on Ike’s career, then goes on to study closely Ike’s record as theater commander for the Allied invasion of Europe in 1944. That close account turns up some criticisms, along with a few surprises, almost all of them having to do with the political aspect of balancing the egos and ambitions of the likes of Bernard Montgomery, Charles de Gaulle, and Josef Stalin, to say nothing of Patton and MacArthur. Eisenhower, for example, remarks that the Battle of the Bulge might have had a more satisfactory resolution had Ike ordered General Omar Bradley “to remove his tactical headquarters from Luxembourg to Namur, where he could control the main battle to blunt the German spearheads.” Such comments will be more meaningful to knowledgeable students of WWII tactics than to general readers, but in the main, Eisenhower’s account is nontechnical and free of jargon—and carries you along from start to finish. Soon to be bedside reading for West Point cadets and budding generals. We’ll hope that Eisenhower follows with an account of his father’s presidential years.